Confession: I was going to entitle this post “Our Favorite Nativities,” but realized just in time I’ve never met a nativity that wasn’t my favorite. One of my goals at Christmastime is to put Baby Jesus into my children’s hands in as many ways as I can. Over the years he has played hide-and-seek with them, been lost (for real) and found again, hung upside down, unwrapped, re-wrapped, broken, freshly washed, fed, burped, snuggled, taken to bed, toted about the house, and I don’t know what all. He has laid down his sweet head on cheap golden tinsel, hillside weeds that looked like straw (ish), various sorts of sticky evergreen, dried lemongrass, and dust bunnies, depending on my decorative preferences of the year. He’s developed amazing resilience, and smiles joyfully through it all. Here’s a peek at our favorites likenesses of him around our house. 1. 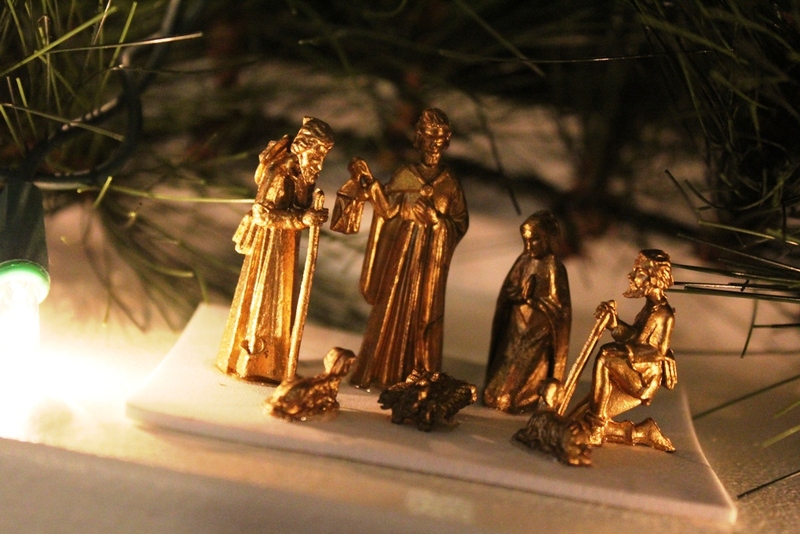 A traditional nativity scene in porcelain is the first one I bought for our home when my boys were babies – fifteen dollars at Walmart, and chosen because we loved the jewels. Baby Jesus’ head broke off the first day we owned him, causing great distress to us (not him). After the re-gluing, the rule on this scene was “eyes only” for many years, but we have relaxed that policy as our more destructive children matured out of their toddler years. Joseph can no longer hold his staff because his fingers are MIA, and the wise men keep sneaking into the stable even though I tell them it’s not time yet. 2. A doll Jesus, wrapped in swaddling clothes, with a knotted fleece cap, is always the favorite of my youngest child. He rests in a manger that my husband and firstborn son made a long time ago, and this year he sleeps on soft golden tinsel. (The lemongrass was a messy disaster.) This Baby is an inexpensive five-dollar doll, but the joy he has brought to our toddlers is priceless. He’s the most life-like of our nativities. 3. 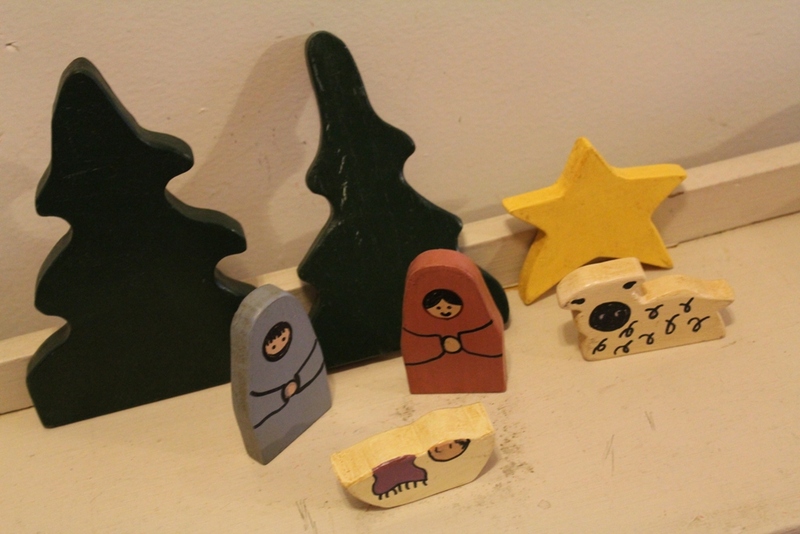 Also child-friendly is this painted wooden collection, handmade by someone Amish or crafty; I forget. My aunt Rhonda gave it to our children several years ago. I love the whimsical lines, hand-drawn in permanent marker, and how homey (almost homely) the whole set is. 4. In contrast, these golden miniatures have stunning detail – but they are tiny! For perspective, look at the little twinkle light on the left of the picture. Kelly and I found this gem for a quarter at a garage sale in this summer, a new set for our family. 5. I told you one of our Advent activities was making nativity scenes from unusual materials, right? The next three sets are our handiwork. Regan made this set from marshmallows and pieces of felt. I think it’s so darling. 6. Aarick and Kelly worked together to make a sweet Popsicle stick and fabric arrangement. Aarick made the stable; Kelly made the people. 7. I went for abstract, with packing material and yarn. 8. 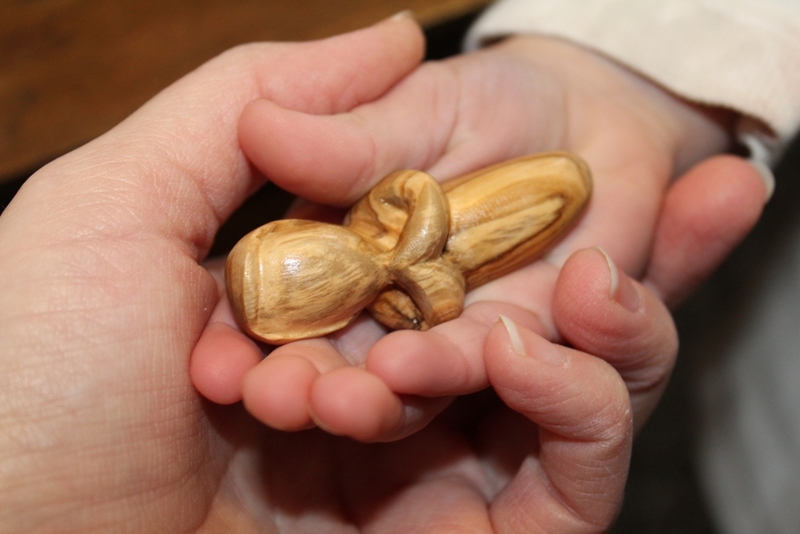 But my very favorite is the last one: My mom and sister scoured Jerusalem this December to find me a nativity hand-carved from olive wood. There are wise men and a camel, a shepherd and his sheep, the Family, and a wonderful stable with a star and a palm tree. I am in love! Baby Jesus rests in a heart-shaped manger, and my goodness, he is sweet! Which of the sets is your favorite? 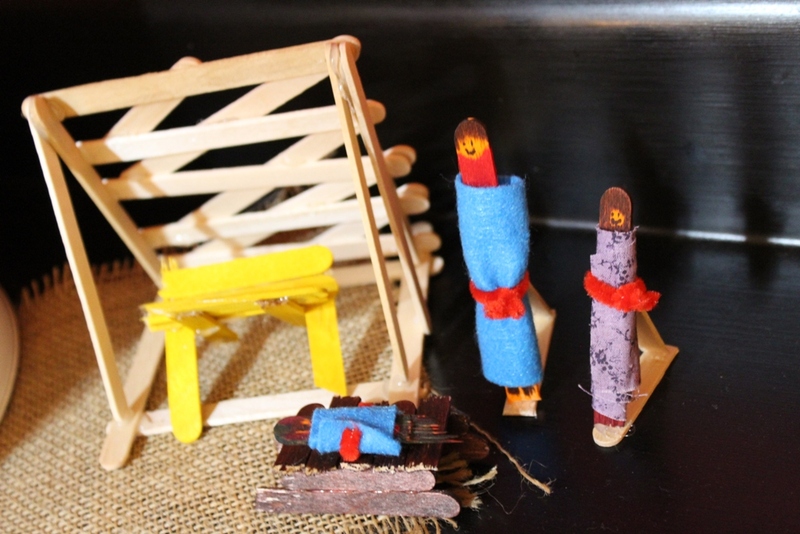 Have you made your own nativity scene? How do you put Him in your children’s hands? I love this post! 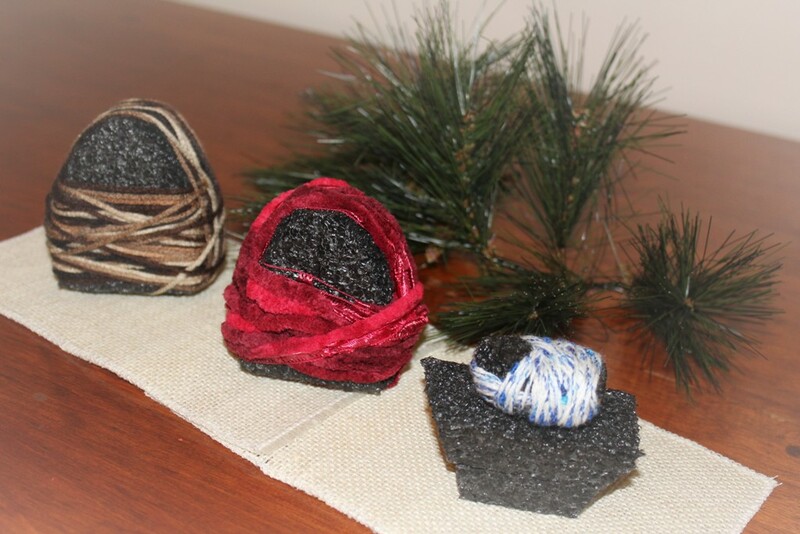 All of your nativities are beautiful, including the Advent projects. I think my favorite is the doll in the manger. He’s such a happy baby! We also have several sets, though they don’t all get to come out of wraps every year. I just don’t have enough spots to display them. We have a very special heirloom ceramic one, handmade by hubby’s grandmother, very breakable and irreplaceable, that has stayed hidden most of our children’s earliest clumsy years. This year we think they’re ready to be careful with it, so it will be brought out tomorrow. I know, I’m late getting it done. But we kind of prefer to not decorate long before Christmas. I do not like to dust around Christmas decor! And hubby gets tired of the clutter in our small, full rooms. My Christmas mail will actually be New Year’s mail this year. Do you still want to receive mail after the New Year celebrations are over? I totally read the title for this post as “Our Natives” ? 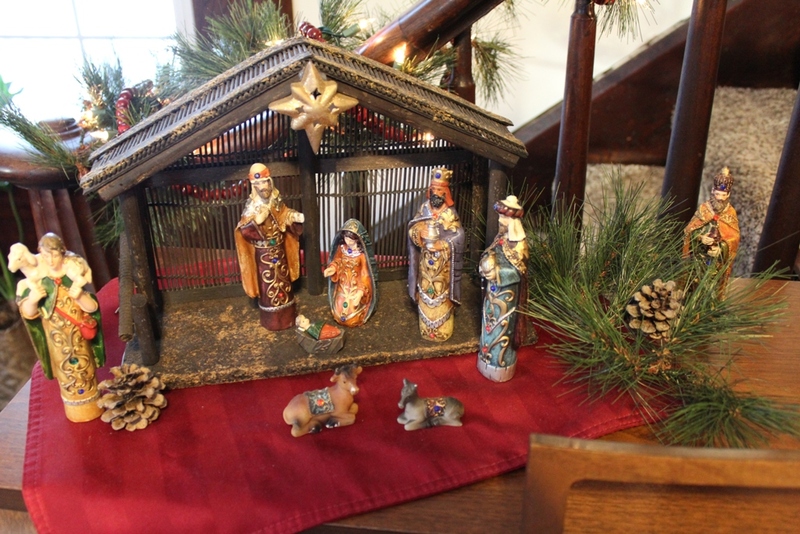 As a child, we carefully arranged our nativity set every year — a cardboard box and people made from clothespins. A yellow, paper star was always hung above it with invisible thread. I haven’t thought of that in years! A few years ago I purchased a Fisher Price Little People Nativity which my many littles love to play with during December. I love this post. I agree there isn’t a nativity that I don’t like either, we have several around the house and each one is just so special. I loved your discription of your porcelain (first set) nativity scene. 🙂 blessed by your words. Can’t wait to spend sometime with your sweet family next week. Ah, the olive wood one! That’s going on my next-year wish list….it looks like a fitting consolation prize for the bleak prospect of spending Christmas overseas without my family (just a few hours from that shopping in Jerusalem). For now, I love my Willow Tree set…so simple and understated. Aw, thank you! 🙂 Until this moment I never realized you are *this* Yolanda. I’m sorry for being so blond. 🙂 Your praise will make Kelly’s day. My 2nd grader’s teacher asked for volunteers from her pupils mamas to teach Friday art class. I took a 10# box of air dry clay and had each child model a piece or two of their choosing after I had discussed what a nativity was and had them imagine what all might have been there. I had made a cave/stable before class myself to give them something to scale. As you can imagine with a roomful of 10 1st and 2nd graders the result was whimsical and charming to be sure. To sis Claudia above: Passports are high on my priority list. How fun! I would love to see that set! I think the one that charmed me most was the marshmallow set…good job Reagan! =-) I still remember sitting at the piano with you, that was so fun! This summer, I found an Avon nativity set at Goodwill. It is porcelain, but was cheap, so I put the many people and a piece of cotton batting in a basket (angels need clouds) and told the children it was theirs to play with. It has been arranged and rearranged in many different scenes, and is greatly loved. They named the wise men’s transportation “the condescending camel” and one day the angels sang on top of the clothes hamper. Very good entertainment. And your precious, hilarious kiddos... If only mine and yours could hang out. I'm pretty sure the world would never see such fun - if the world was still in existence afterward. The olive wood. is. beautiful. Love that your children made their own scenes. How creative! Ours is porcelain, a castoff from my sister. We glued Joseph’s head back on this year-with an expanding glue, which ended up looking like he was chilly and needed a ruffled scarf. Pieces have been glued and reglued. “May I rearrange the manger scene?” does have its downside. I don’t blame them, though. It IS special. I really love your and Shaunda’s Jesus doll babies! Such a great way to make the story come alive. Lol, a porcelain castoff from my sister. Let me rephrase that. It was on her yard sale pile and we rescued it. 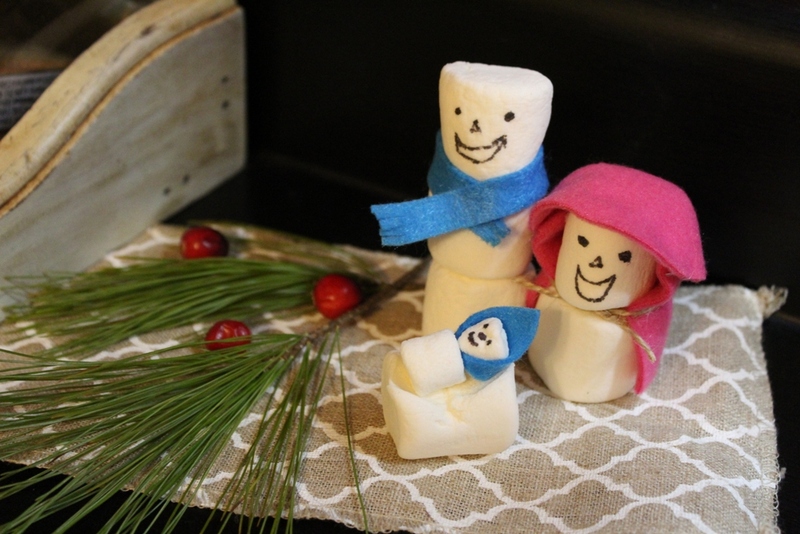 I pick the marshmallow people for #1! I found a cute porcelain set at goodwill, all chubby little children. Then I found a clear glass set, smaller, on clearance. Then another set of chubby kids of resin that my little ones played with. Now my baby is an 8 year old boy with a great sense of humor. Today the wise man was standing on his head. Hanging on to his present for dear life. My mom always let us play with the manger scene which she made with ornaments from a store called Murphy’s. My dad made a wooden stable & put sawdust on the floor….good times! Love this post…Merry Christmas! oh. 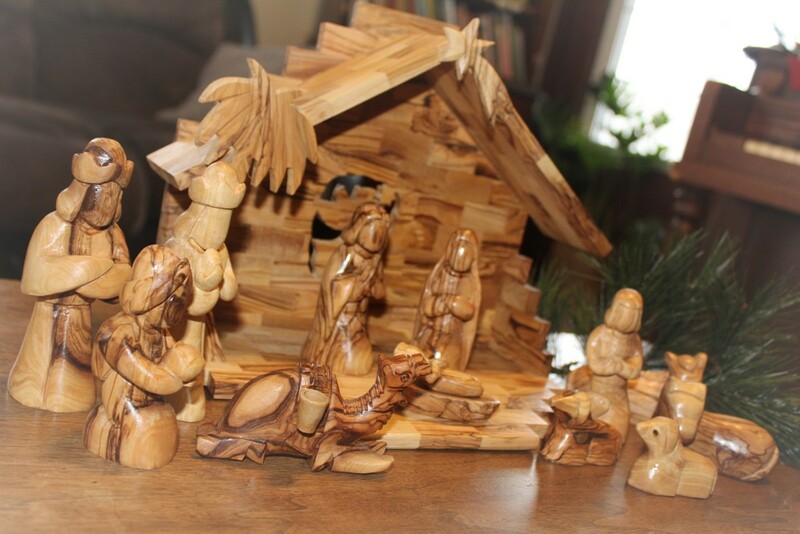 I ADORE your newest hand carved nativity from across the ocean!!! I don’t think I can pick among them. Every single picture made me happy. (I have a weakness for nativities too.) I must say, the homemade ones melted my heart completely though! They were extremely well done! !